Obama came into office amidst grand promises to restore America's place in the world. Unless our place is the outhouse, he's failed. President Barack Obama likes to see himself as a moral leader. “The arc of the moral universe is long,” Obama likes to say, quoting Martin Luther King Jr, “but it bends toward justice.” According to Obama, Obama is a genteel representative of decency and good grace, a man pointing America toward a broader vision, a fellow questing for social justice and contextual consideration. Obama’s legacy is one of failure all around the world. He leaves office with a genocide in Syria on his record — a genocide he pledged to prevent, then tolerated and finally lamented, mourning the fates while blithely ignoring his own cowardice. Libya, meanwhile, remains a full-scale disaster area, with tens of thousands of refugees from that failed campaign swamping Europe, along with those fleeing Syria, and his leftist European allies paying the political price. China has grown its sphere of influence across the South China Sea, putting American allies from Taiwan and Japan to the Philippines directly under its thumb. Thanks to Obama’s military cuts, China believes that it can bully American allies into embracing Chinese supremacy in international waters — and it may be right. Simultaneously, Obama continues to drive America into debt, and the Chinese are large buyers of that outstanding debt. Obama came into office amidst grand promises to restore America’s place in the world. Unless our place is the outhouse, he’s failed. But at least he feels good about his accomplishments, even if thousands have died — and thousands more will die — in order to ensure his moral stature in his own mind. Ben Shapiro, 32, is a graduate of UCLA and Harvard Law School, a radio host on KRLA 870 Los Angeles and KTIE 590 Orange County, host of The Ben Shapiro Show, and editor-in-chief of DailyWire.com. He is the New York Times best-selling author of Bullies. He lives with his wife and two children in Los Angeles. One of the worst things about Obama is his Christlessness. It takes more vestiges of Christianity than he possesses to get why Israel is significant. Many point to the democratic status, but it runs deeper. Now why should any of that matter ? In the self absorbed world of the outgoing leader of the free world what really counts is his perception that were he to have run against the now PEOTUS there would be little doubt that his reelection would have been won handily. Now while there may be some who question the first ladies gender & others have perhaps more legitimately questioned Pres.Obama’s birth certificate, I simply question the POTUS’ grasp on reality. As the author implied regarding Mr. Obama, it is to his own self that he be true. That may be his most significant contribution to his tenure in office. The elevation of smooth personality over rational foreign & domestic policy. In terms of Syria, O’s ultimate failure is continuing the farse of ‘humanitarian’ operations to disguise intentional attempts at regime changes. Were it not for ‘Russian influence’, Syria would have fallen to the terrorists and the citizens of Syria would no longer have had their democratically elected leadership. Not to mention the fact that the terrorists were being funded, armed and protected by the entire Western-Arab coalition. To me, the above points aim more directly at O’s failures. The uninformed and propagandised Western perspective on Russia on the global stage today is dangerous in its ignorance, points to complete reliance on the MSM spin and an obvious bias towards exceptionalism of certain countries over other sovereign countries and the overarching governance of international law. WOW, for a ‘best-selling author’, from Harvard … this is a poor effort. Mr Shapiro, you say nothing new or even very interesting. We all know that the US has a weaker position in the world as the post-WW2 arrangements of nation-states, economic alliances, and political-security arrangements are falling apart … to become something we don’t know yet. But those of us with excellent education – not from Harvard – in our case, Swarthmore, and University of Virginia, and most fundamentally, a working family farm in the Valley of Virginia – have had a saying for years: ‘when they come from Harvard, they rely on the degree to impress everyone that they must have ‘first-class’ minds; while the rest of us actually HAVE to develop first-class capacities to think, assess, reason, discern and practice wisdom’. Anything to say on the content of this article? Of course not. And using a Bible reference in your user name, on top of it all. You know and care nothing about the Bible. Huh? We said clearly that the writer’s theme of American weakness in the dissolving post-WW2 global arrangements is well known, a shambles, and dangerous. It’s obvious. So where is the brilliant Harvard-ite’s programme for the next one year, five, ten, fifty? When a brilliant chef writes an article about what a nasty sauce he/she/they encountered we expect a better recipe. Shapiro announce the sauce is nasty and gives no recipe. BORING! and POINTLESS! Thank you, Ben, for the excellent run down of the mess that Obama has accumulated internationally. 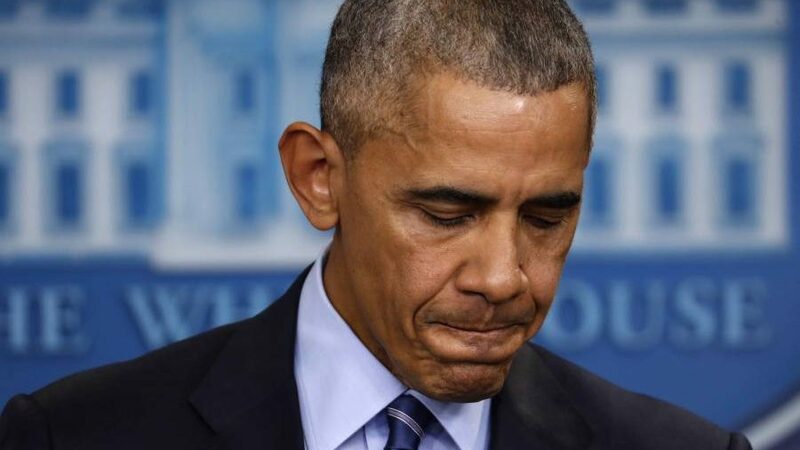 Meanwhile right here in the United States, we have Obama (and the do-nothing “leaders” in the legislature—let’s not forget them) to thank for one of the most abominable, cancerous erosions of American culture that has happened since its inception–Obama’s “reign” has truly been unprecedented. Under Obama, people are now sued, jailed, and fired for not approving of or participating in homosexual “marriages”–and he even had the White House bathed in rainbow colors to celebrate the notorious Supreme Court decision that finalized it. Under Obama, our school children can’t even have boys and girls restrooms or even shower facilities–thankfully, that battle is still being fought. Under Obama, people who were previously struggling to make ends meet and who couldn’t afford health care for their families now have to pay through the nose for a piece of trash insurance product with outrageous deductibles and astronomical co-pays—and they’re legally required to pay it, even if it amounts to hundreds of dollars—translation: they’re more broke than ever and STILL don’t have health care! Yes, Obama paved the way for Iran to have nukes, snubbed Netanyahu (and repudiated Israel), ramrodded in illegal immigration, and fomented more racial strife than any previous president—those are all glaring issues that have caused unbelievable damage. But the internal cultural and moral damage he has done is perhaps just as bad, if not worse. We have a long way to go to repair our society from the cancer of liberalism that he has done nothing but spread.